At the initiation of the Mullen Hall Parent Teachers Organization, the School Committee requested $80,000 and was appropriated $50,000 from the CPFund in 2007 in support of the construction of a Village Science Playground. The intent was to create a public playground in the heart of Falmouth, across the street from the Public Library, with a community character theme emphasizing science and the surrounding natural and nautical environment. The park, completed in 2007, enhanced the school’s Kindergarten through fourth-grade curriculum as well as the quality of life and vitality of the Falmouth Community. People of all ages visit the library for its many programs and events, including weekly story hours for children and adults. The playground provides a welcome addition to library activities and other town events. 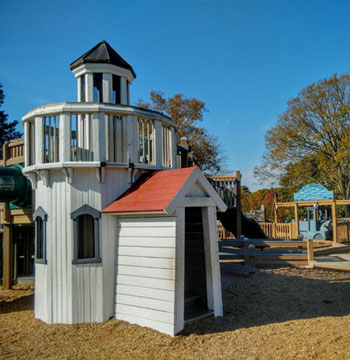 Development of the playground received strong support from volunteers as well as the Woods Hole Oceanographic Institution and MBL. The United States Geological Service constructed a central feature of the playground. The Falmouth Enterprise and Falmouth Community TV supported and chronicled progress throughout. The additional funds needed to cover the total construction cost of $183,000 were raised by individual donations and a community fundraiser.